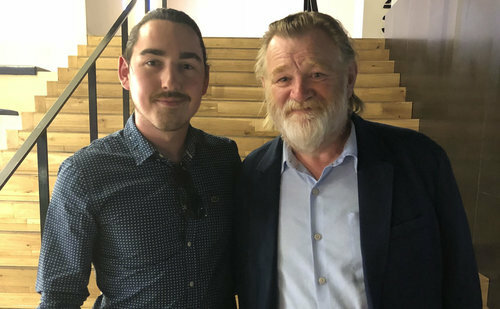 IFTN caught up with Brendan Gleeson ahead of the special Sky Arts screening of his new short film ‘Psychic’. Brendan Gleeson's first outing as Director delivers a skillful and intriguing short film. 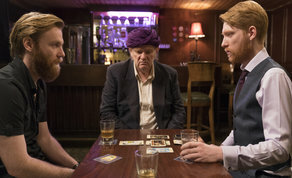 Written by Rory Gleeson (‘Rockadoon Shore’), ‘Psychic’ tells the story of a charismatic psychic (Brendan Gleeson) who is forced out of retirement by his two manipulative sons (Domhnall and Brian Gleeson) and taken on the road. The last obstacle to gaining a large cult following is a TV show host (Ingrid Craigie) determined to bring them down. A light and dark tale of family showmanship and the suspension of disbelief. ‘Psychic’, which launched at The Galway Film Fleadh is produced by Juliette Bonass (A Date for Mad Mary, Glassland, The Last Hotel for Sky Arts) and Brendan Gleeson and is co-funded by Fís Éireann/Screen Ireland and Sky Arts. It will air on Sky Arts next year (2019). IFTN: Brendan, how did you find the overall experience of directing your first film, coupled with your acting commitments in front of the camera? IFTN: An actor I have previously interviewed who was also the director and producer on his film, found that he was rushing through scenes in front of the camera in order to stick to the schedule (as a producer) rather than focusing on the actual scene at hand. Then of course there was the temptation, in the edit, to pick the take in which he looked best as opposed to what worked best for the film. Did you find yourself in a similar predicament? 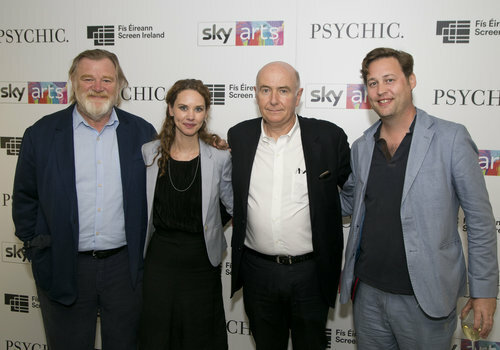 Brendan with Producer Juliette Bonass, James Hickey, and Sky Arts' Acquisition Manager Jack Oliver at the Sky Arts screening of 'Psychic' in the Light House Cinema, Smithfield. IFTN: Even in the scenes between Brian and Domhnall in the studio, you are still in the background being interviewed by Ingrid, it must have been tough to direct from that position with no green screens! Brendan with IFTN Journalist Nathan Griffin. IFTN: You have obviously read a lot of scripts in your day, and it is your son Rory’s writing debut. Did you have any advice for him approaching the script? IFTN: Domhnall’s character touches upon it in the film whenever he asks Brian’s character, "Do you even believe in this stuff?" to which Brian’s character replies, "The two of us do. ", which causes the audience to then question it. Brendan with son Rory (writer) at the Sky Arts screening. IFTN: While we are on the topic of parental love, the film itself is a very family-centred project, your son Fergus also did the music, and Juliette produced. I am interested to know what the dynamic was like and how much you enjoy working on it together? 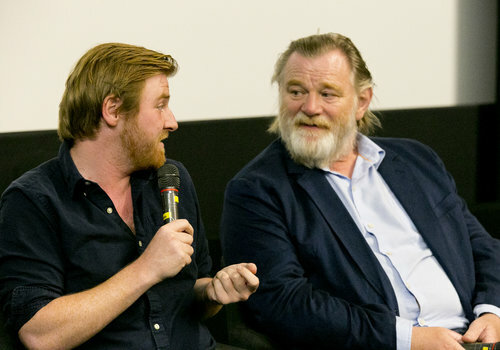 IFTN: This isn’t your first time acting alongside your two sons, having worked with Domhnall and Brian before on Enda Walsh’s ‘The Walworth Farce’. I am interested to know how the dynamic might have changed this time around. IFTN: Dave Grennan did the DOP work on the project. How invaluable was his experience in assisting you through it all? IFTN: Ingrid Craigie does a great job of trying to appease the three Gleesons in the film. Can you tell me a little bit about how she got involved with the short? IFTN: The humour in the film is very quirky. There is a definite sense that you all enjoyed the jokes, but could you tell me how you went about developing the jokes and humour on set? IFTN: Due to the fact that it was your two sons who were playing your sons in the film, did you feel that you could be a little bit cryptic because people would almost naturally make that connection? IFTN: Finally, you have touched upon it already, but can you tell me a little bit more about the screening of ‘Psychic’ at the Galway Film Fleadh? ‘Psychic’ will air on Sky Arts early 2019. Brendan Gleeson is best known for his roles in John Michael McDonagh’s ‘The Guard’ (2011), ‘Calvary’ (2014), and Martin McDonagh’s ‘In Bruges’ (2008). The three-time Golden Globe nominated actor received critical acclaim for his portrayal of Winston Churchill in HBO’s ‘Into the Storm’ (2009) for which he received a Primetime Emmy award in 2009. Gleeson is also a two-time IFTA winning actor having most recently received the ‘Best Lead Actor - Film’ award for Calvary in 2014. The Irish actor currently stars in AT&T’s original series ‘Mr. Mercedes’, created by David E. Kelley and based on the critically acclaimed Steven King novel. He is also set to feature in Ireland’s first stop motion feature film ‘Captain Morten & the Spider Queen’ later this year. ‘Psychic’ stars Ingrid Craigie, Brendan Gleeson, Domhnall Gleeson and Brian Gleeson. The short film is written by Rory Gleeson and produced by Juliette Bonass. Directed by Brendan Gleeson, David Grennan is DoP, the music composed by Fergus Gleeson, editing by Isobel Stephenson. Production design is by Tamara Conboy, while Consolata Boyle is costume designer.